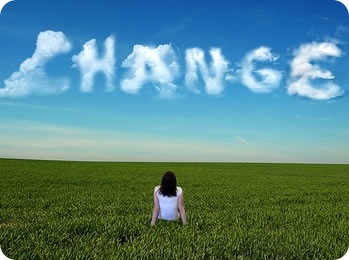 Change is…a major force in your life that you cannot ignore when it comes knocking on your door. Once that happens, you start the process of disengagement. What that means is, you start separating from that once familiar part of your life that you now know is not working and you set about initiating with focused clarity, changes in your life. You then start the process of redirecting your thoughts and your focus towards what you truly desire and how you plan to experience your life in future. The old no longer holds you in its iron grip. Whatever reason that precipitated the need for change becomes secondary, as all of your attention is focused on the future, making plans, and setting new achievable goals. Change of this nature is empowering because you have a clear and focused image in your mind of your goals and desires and expected outcomes. With confidence and courage you now redirect your life towards reaching those goals. This committed drive to change your reality, will result in a life of joy, creativity and personal satisfaction which you were missing before. It is a known fact that when one is committed, the universe joins in the dance and everything falls into place. People, mentors, opportunities, workshops, books all appear just when you need them. Then like the saying A Reason, A Season, A Lifetime, some of these people who have helped you will leave because you no longer need them. The Reason they came into your life is over. Their work is done. The Season ones stay a little longer and they also leave when their work is completed with you. The Lifetime ones stay on and through your relationship with them, you continue to learn and grow and become more than you ever dreamt possible. That journey you initiated has indeed changed your life. You are more confident, poised, joyful, happy, and your creativity is at its peak. You are at peace with yourself and your world. “What you are is God’s gift to you. What you become is your gift to God.” I say God. You can substitute Source, Creator, Buddha, The All, by whatever name you refer to that ultimate and divine being. I’d love your thoughts on this. And don’t forget to leave a link back to your own blog as well via the commentluv feature here on the site. To be continued: Transition – Overcome unexpected loss and change. This will be the subject of my next blog post. This entry was posted in Lifestyle, Personal Development, Self Development and tagged changing your reality, Healing Path Centre, how to change your life, law of attraction, Life Mentor York Region, lifestyle coach, lifestyle mentor, Sharon deRyck by Sharon. Bookmark the permalink.